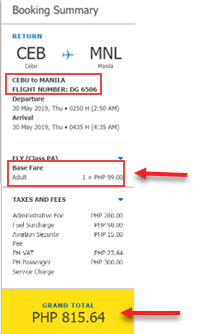 Cebu Pacific promo ticket at P99 base fare up for booking! This is only a One-Day Seat Sale. Book your flights from Manila to select domestic routes for P99 one-way base fare promo. For international trips, for as low as P432 base fare, travel from Manila to Singapore or Kota Kinabalu trip. Cebu Pacific base fare promo tickets to several destinations in Asia also available. Then, there is more! Cebu Pacific ALL IN promo fares from Manila to Guam, Sydney or Melbourne are offered on this seat sale. 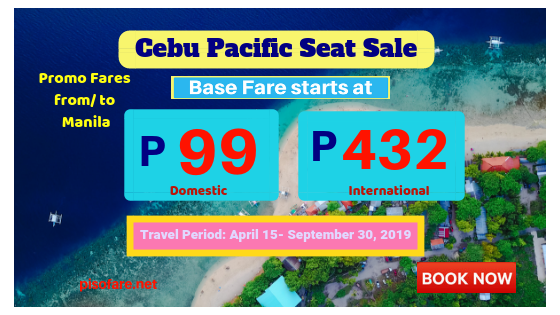 Grab the sale tickets of Cebu Pacific ASAP, booking period is ONE-DAY ONLY on April 3, 2019. Good for one-way trip, quoted Cebu Pacific promo fares are base fare promos only except for sale tickets to Dubai, Sydney and Melbourne. The low fares include up to 7 kilos hand carry baggage but no free checked baggage allowance. For base fare promos, Web Admin Fee, taxes, Fuel Surcharge and Terminal Fees are excluded from advertised ticket rate. Hurry and book the sale tickets! Booking online at www.cebupacificair.com is the fastest way of getting Cebu Pacific promo tickets. Promo Code is not requited when booking. Payment can be made thru Credit Card/ Debit Card, Alipay, PayPal or pay in cash via Payment Centers. When paying at Payment Centers, be sure to have your Booking Reference Number. 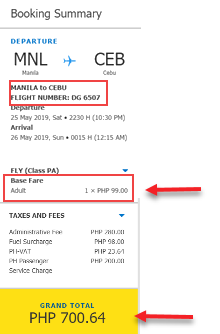 Another option would be to call Cebu Pacific Reservation Hotline Numbers and reserve the affordable fares with their Customer Service Reps.
Buying ticket at Cebu Pacific sales offices and accredited ticket booking office and travel agencies would be another way of availing the promo. But there might be some problem because these offices are operating on business hours. Cebu Pacific sale tickets are limited and might be sold out by the time they are open. Grab Cebu Pacific promo fares now and travel with less expenses on fare! Enjoy your trip! Watch out for more Cebu Pacific seat sale 2019, Philippine Airlines promos 2019- 2020 here in our Facebook: PISO FARE TICKET!